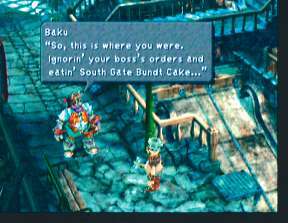 Final Fantasy 9 has numerous side quests that will excite you (and sometimes bore you) throughotu the game. While most side quests are completely optional, we recommend that you at least try every one of them. Most land you a great reward! In the beginning of the game, when Baku explains the kidnapping plan to Tantalus, choose the option "That's when I kidnap Queen Brahne, right?" 64 times. Once you're done, Ruby will pop in and you can witness an extra scene with her. 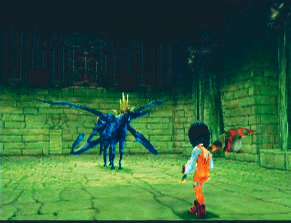 One of the big secrets of the game is that Princess Garnet's true name is engraved on the Eidolon Wall at Madain Sari. There is a very complicated way to reveal the truth at the beginning of Disc 4. First, form a party with Dagger and visit Lani who is standing on Eiko's back porch. Upon arriving Lani will run away. Exit the village and return with anyone except Dagger or Amarant and talk to Lani twice. Read the message and go to the Eidolon Wall. Walk clockwise from the entrance (heading to the right) until you return to the entrance. Move just past the "!" until you hear a chime. Then walk counterclockwise back to the entrance, just past the "!" again. Repeat this 9 times, going back and forth. Make sure you hear a chime each time. On the ninth round, your HP/MP will be recovered and all status abnormalities removed. Garnet's real name is Sarah, and her mother's name is Jane. If you go into the Weapon Shop with Zidane in Alexandria at the beginning of Disc 3, you will encounter the Nero Brothers (Benero, Genero, and Zenero). They will ask you to play a game similar to the shell game. You only receive Gil as a reward for playing, maxing out at 25,600 Gil. The best tip to provide for this mini-game is to use the Pause function. Recording the game with a VCR and then reviewing the playback in slow motion makes things vastly easier. 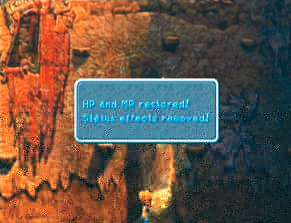 The first mini-game encountered during FINAL FANTASY IX is the jump rope mini-game in Alexandria. To participate, have Vivi approach the little girls jumping rope to the left of the ticket booth. Once he has done so, the girls offer to let him join. This is a good opportunity to earn some Gil, get extremely rare cards, and obtain a Key Item very early in the game. After Vivi moves over the rope, press the Circle button to begin the game and press the X button again to jump each time a "!" appears over Vivi's head. Jumping rope is fairly easy, but don't underestimate the game! The speed at which the rope moves increases at 20 jumps, increases again at 50 jumps, and then once again at 100 jumps. At 200 jumps, the speed subsides a bit, but the timing is different. After 300 jumps, the speed and timing of the jumps remain the same. You can play the jump rope mini-game at the beginning of Disc 1. At the beginning of Disc 3, the jump rope girls move their game to the moogles' bell tower. You can only play during Disc 3 and 4 if you have Eiko or Vivi in your party. You can only win each reward one time. You will not receive the same reward again if you start over and match the number of jumps you achieved previously. 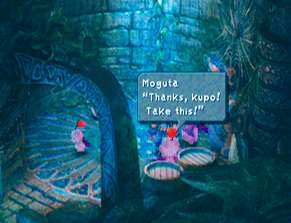 Each time you receive a Kupo Nut for delivering mail between the moogles, return to Gizamaluke's Grotto and feed it to the father of the moogle family. You'll receive a random item in return. During the Chocograph treasure hunt, one of the stashes contains a full set of Hawaiian gear, but only 7 Aloha T-shirts. That leaves one of your characters out of the luau! Return to Gizamaluke's Grotto with a Kupo Nut during Disc 4 and the moogle gives you the 8th Aloha T-Shirt. Depending on when you visit the Weapons Shop in Treno, you can have one character duel with a monster that the owner has caught and caged under the floor. You can fight one monster during Disc 2, one of two different monsters during Disc 3, and only one monster on Disc 4. Here are some fighting strategies for each of the monsters. Use Steiner and equip the following: Gold Choker, Auto-Potion ability, and Bird Killer ability. If you have five or more Hi-Potions, sell all of your Potions so that your Hi-Potions are used when Auto-Potion kicks in. Make sure Steiner is at least level 7. Use a tent on the monster (see the Catoblepas strategy), and it will receive every status effect that it cannot Guard against. Equip the Jelly ability and Beast Killer ability, and use equipment that defends against Thunder and Earth or use the Auto-Float ability. Catoblepas remains in Treno until the end of Disc 3 or until you defeat the monster. Use a Tent on him until the beast bites him (this happens one-third of the time) and he will receive every status effect that he will not GUARD against. You can also use the Blue Magic Roulette if available. Since there is no consequence for losing the battle, use this ability until the happy little finger lands on Catoblepas. Amdusias casts Lv4 Holy, so avoid levels that are multiples of four or equip equipment that defends against Holy. Equip the Antibody ability, and defend when it's in the air because it will only use physical attacks at this point. Equip Auto-Reflect if possible, because it only uses magic on the ground. Also, equip Auto-Regen or Auto-Potion and the Counter ability if possible. If you have Reflect, Amdusias will kill itself and you can just defend. At this point, use a Tent on the beast until the snake bites him (this happens one-third of the time) and he will receive every status effect that he will not GUARD against. This monster is extremely difficult, even at high levels. It's best to use an attack that kills the Behemoth instantly. You can use the Blue Magic Roulette or Zidane's Soul Blade attack when he has the Sargatanas weapon equipped. This will instantly petrify him. The Weapon Shop monsters don't reward you with any EXP or AP, but the store clerk will give you a prize for each monster you defeat. After leaving the Ice Cavern, head to the Observatory Mountain before going into Dali. 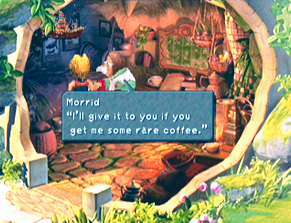 There's an elderly fellow named Morrid inside the hut, who's just dying for a good cup of java. Find the three coffees at different locations in the world and return to Observatory Mountain with them, before the end of Disc 3, and Mr. Morrid will reward you. Burman Coffee = This one is a little harder to get, however, so keep reading! To get the Burman Coffee, Zidane must leave Treno during the card tournament and head through South Gate to Dali. The mayor is not at home at this time, so search his house for his key. When you enter his house, Zidane spots the mayor's son napping on the sofa in the middle of the room. If Zidane moves too hastily, he'll awaken the boy and have to start the search over again. Start by searching the mayor's desk. You will find the Mini-Brahne here. Search the desk two more times until the boy says "Zzzz." Move to the stove and search it to find the Mayor's Key and then leave. Go to the locked door in the windmill and use the key to open it. Move around the chocobo pen to the right side, where a hidden treasure chest contains 30,000 Gil. Check the same chest again to find the Burman Coffee. Now return to Observatory Mountain and give the three coffees to Morrid. He promises to send you the Mini-Prima Vista model ship. The next time you're in Lindblum, return to the Tantalus hideout to find it sitting on the floor near the bed. Again, you must get the Burman Coffee during the card tournament in Treno. Otherwise, it will be too late. You can visit Morrid to complete the side quest any time before visiting Terra. When you enter the frog pond area of any Qu's Marsh, Quina asks to spend some time catching frogs. Quina must be in your party for this to occur. If you agree to let him/her catch frogs, you can control Quina as s/he runs around the pond attempting to catch the frogs that leap onto the ground out of the water. There's no real strategy to this; you just need to be swift. 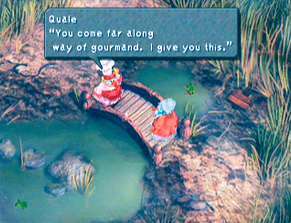 As Quina catches more and more frogs, Quale appears occasionally and congratulates Quina on his/her progress. The master Qu then bestows items upon Quina as rewards for catching frogs. If you can catch 99 frogs, Quale challenges your party to a battle. The trick to this side quest is to always leave a male and a female frog in the pond. Otherwise, it will take an incredibly long time for the pond to repopulate with frogs. The spawning rate is also much faster if you leave the Golden Frog with a male and a female frog. One strategy for chasing the frogs is to learn the differences in color. Female frogs are usually a much brighter color than males, while baby frogs are smaller and more olive-toned. You may want to change the Contrast on your television or monitor to distinguish more easily. Avoid chasing baby frogs, because they will grow up to become adults and will be much easier to catch then. For example: If Quina is at level 50 and s/he has caught 100 frogs, Frog Drop will cause 5000 HP damage. Since the windmill in Dali has stopped turning, this is also a good time to climb up top and get the Cachusha and Elixir in the chests. You can only take part in this mini-game with Vivi at the beginning of Disc 3. Hippaul stands with his mother on the main street in Alexandria. 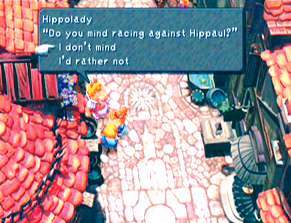 When you speak to Hippaul's mother, Vivi and Hippaul will run a race. Tap the Circle and Square buttons to run to the finish line. Hippaul's level increases the more you race him. For every 10 levels Hippaul gains, his mother gives you a card. You win new cards through level 70, plus a Key Item at level 80. You can actually level Hippaul up to level 100 (but you receive nothing for it). You can get a very powerful sword for Steiner by completing a short side quest. Return to Daguerreo on Disc 4. 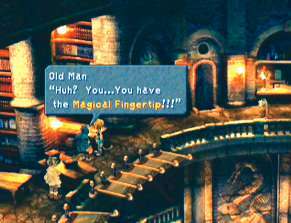 An old man near the Library's Inn asks you to look out for an item called the Magical Fingertip. Go to the Treno Auction and bid on this item. You may have to pay somewhere around 85,000 Gil in the bidding war, so make sure it's worth it to you. If you don't see the Magical Fingertip at the Auction House, then you may need to sell all of the Key Items you purchased at the Auction previously, such as the Doga's Artifact, Rat Tail, Griffin's Heart, and Une's Mirror. This should make the Magical Fingertip available at the Auction House. In addition, you should be able to repurchase the items you had to sell. Take the Magical Fingertip back to the old man in Daguerreo. When you give him the item, he tells you his life's story and then gives you Excalibur. This sword, which is not as powerful as the Ragnarok found during the "Chocobo Hot and Cold" game, enables Steiner to learn Climhazzard. We've mentioned earlier that several items for sale at the Treno Auction House are from previous FINAL FANTASY titles. There is some purpose to this. After returning to Gaia from Terra, purchase Doga's Artifact and Une's Mirror from the auction and return to the Black Mage Village. Speak to the Black Mage standing in front of the phonograph inside the Inn. This causes the background music to change to a tune from FINAL FANTASY III's soundtrack. This special music continues until you leave the village. You can win the rare Namingway Card from Mario during the card tournament in Treno. 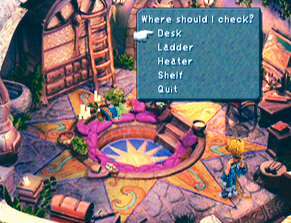 You can also find the card inside Kuja's room during the sequence in the Desert Palace by searching behind the stacked books in the foreground. Take the card to Daguerreo and find the man roaming the library on the mid level. 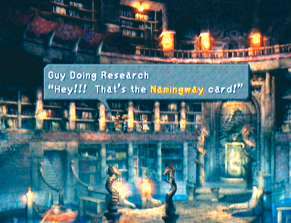 He asks to see the card, and then becomes inspired to create new names for your playable characters. You can now ask this person to rename any of your characters, including Zidane! To reach the mid level, examine the strange block next to the Medicine Shop. This releases an obstruction. Speak to the scholar near the bookshelves at the left of the room. After finding the book he's looking for (in the right of the room), speak to the scholar again. This causes him to move from his current location. You can now access a hidden ladder that takes you down to the middle level. :: 1 point for every chest, searched Field icon, and item gained in event sequence, and every rare item purchased in the Treno Auction House (with the exception of Magical Fingertip and Pearl Rouge). :: 2 points for every chest found on the World Map while riding Choco. No points are awarded for items found while digging in the "Chocobo Hot and Cold" game or bought from Stiltzkin. 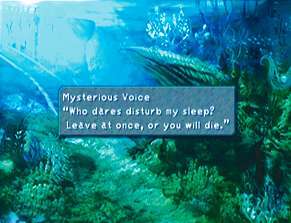 Here's a challenge for you true gamers: play FINAL FANTASY IX again and reach the Terrace in Memoria within 12 game hours. You can find the Excalibur II on the Terrace in a corner to the right. This is the most powerful weapon in the game! Extremely late in the game, you can encounter Hades, an optional Boss. If you fight and defeat Hades, you can synthesize the best items in the game. In Memoria, you will enter a room in which Quina thinks that there is water and tries to swim. After the scene, search the hidden area amongst the coral on the right side of the screen. When an ominous voice begins to ward you off, persist in the conversation to fight Hades. You must continuously press the confirm button here, since a "!" icon will not appear. This Boss is not easy. Your crew must be in tip-top shape, and have all the right abilities and weapons equipped to survive. However, if you can outlast the master blacksmith, he will allow you to forge extremely rare and extremely expensive items. One of them is the Save the Queen sword wielded by Beatrix. Also, you can forge the Robe of Lords, the Tin Armor, and the Pumice for the first time. Pumice lets Dagger summon the amazing Ark. You need the Hammer to forge more than one item on the list, so you must complete the Stellazzio side quest in order to get it. The only way to defeat Hades is to prepare extremely well beforehand. He's just a bit more difficult than the final Boss, but equipping the right weapons and abilities beforehand will take you a long way. The best party for this fight is Zidane, Dagger, Steiner, and Vivi. Everyone needs to be at a high level, with plenty of stones to equip abilities. Equip everyone with the following abilities: Auto-Regen, Antibody, Clear Headed, and Body-Temp. Hades performs a Curse spell on everyone, which imposes several statuses at once (Darkness, Confusion, Poison, Slow, and Mini), which can be devastating. Equipping Zidane and Steiner with the Auto-Haste and High Tide abilities also proves strategic. Vivi and Dagger should have the Half-MP ability, and you should equip Dagger with Boost. Also, make sure that Vivi has learned the ReflectX2 ability. Vivi should be able to cast Flare, and Dagger should have the ability to cast Reflect. 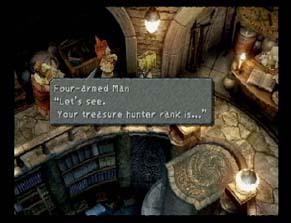 Equip Zidane with the Ultima Weapon and the Mug and Bandit abilities, and preferably Master Thief as well, and ensure that Steiner has the Ragnarok. You can get this by completing the "Chocobo Hot and Cold" side quest prior to engaging Hades, which lets you obtain it from the Outer Island. You have several rounds to attack before Hades gets serious. Steiner will inflict 9,999 HP of damage each round with Shock, and Zidane should steal, attack, and steal as described so many times before. He should cause around 2,000 HP when mugging Hades. During the first turn, have Dagger cast Reflect on herself and have Vivi cast Focus. Better yet, you should consider equipping the Auto-Reflect ability on Dagger for a consistent effect throughout the battle. In the next round and each round thereafter, Vivi should cast Flare on Dagger, which will be reflected at Hades, inflicting 9999 HP due to the doubling Reflect ability. Dagger's summons will cause some amount of damage, but she is better utilized by healing the party. If a character gets KOed, cast Life on them and let Auto-Regen do the healing. Try to dispose of Hades in under eight rounds. Otherwise, he will charge up his sword and perform Doomsday. This awesome spell levels everyone who isn't equipped with armor that protects against Shadow. Another good tactic is to fight a bunch of random battles in Memoria before this fight, and get everyone close to Trancing before taking on Hades. That way, Zidane should be able to cause a lot of HP damage to Hades with a few Grand Lethal Dyne attacks. Another good strategy is to replace Dagger with Eiko or Quina to counter Hades' Curse spell. Quina can use the Angel's Snack and Mighty Guard abilities, and Eiko has the Mini spell to counter the Mini effect caused by the Curse spell. You receive 16,383 EXP for defeating Hades, as well as 9,638 Gil. He tells you to bring two Pumice Pieces for him to forge into the Pumice, which lets Dagger summon the Ark. You can find them by digging up a treasure on the World Map with your chocobo and after defeating Ark in Oeilvert. Summoning the Ark makes defeating Necron at the end of the game much easier. 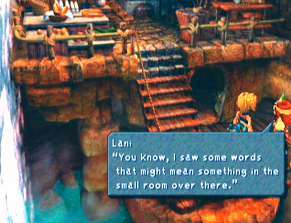 There is a strange writing on the wall of a room there, mentioning Vivi and has a writing style that resembles Quina's speech pattern. 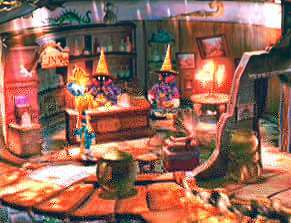 Bring Vivi and Quina in your party and visit that room for a big surprise! 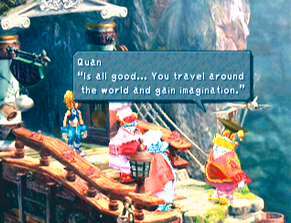 This event elaborates the background story of Quina and Vivi. After the event,check the Clock to get Running shoes. Carbunkle's normal defense skill, Ruby Light, is not the only attack it has! When equipped with the correct gemstones, new effects can be summoned. Fenrir also has an additional skill with this method. At various locations on the World Map, a random battle occurs but the music sounds sweet and melodic. The creatures that appear won't attack either; instead, they beg you to give them a specific jewel. If you give them the jewel, your party receives a ton of AP and sometimes a useful item. What is the secret of these strange monsters? Well, if you encounter all eight of them, you get to interact with the Friendly Yan on Vile Island. When you give this cute little creature what it desires, you get to attack Ozma physically. This is the most difficult hidden monster to overcome in the game, and the characters won't be able to use physical attacks without feeding all of the friendly creatures. 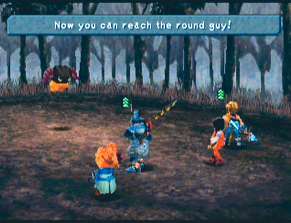 Being able to attack Ozma physically enables characters such as Zidane, Steiner, and Amarant to be more useful in the fight. You may notice that some friendly monsters make reference to other friendly monsters, and even give you the appropriate stone to feed to them. This reinforces the fact that there is a certain order in which to encounter the friendly creatures, and the table at the end of this section indicates the order. The only catch is that you can only find some of the monsters in dangerous, out-of-the-way places. For example, you can only find the Purple Jabberwock in a forest on the west continent, which requires the Invincible airship or the red chocobo to reach. The Friendly Yan's more aggressive counterparts on Vile Island are, in fact, some of the toughest creatures in the game, and may wipe out your party during the effort. If you get attacked by Yans while searching Vile island for the friendly Yan, summon Odin and cast Death on them every round. Also, try to perform the ReflectX2 trick with Vivi, and have everyone else perform their most powerful skill. If Quina can successfully eat one of these enemies, s/he can learn the Auto-Life ability. Yans have around 20,000 HP, making them tough to dispose of quickly. However, each set of three is worth 28,000 EXP and 3 AP, which makes leveling up and learning abilities much easier! You can only view this Active Time Event as Garnet during your first visit to Treno. After going to Doctor Tot's tower to get the Supersoft, instead of climbing the ladder down, go outside and yeah! You can view the ATE now! The most terrifying enemy in the game is not the final Boss, but the creature hidden at the Eidolon grave in Chocobo's Air Garden. When should you fight this creature? Well, I have a few tips to prepare you for this battle, but that's about it. You must complete most other sidequests first. You must have the gold chocobo to access Chocobo's Air Garden. To find Ozma, go to the Garden and ride Choco to the back islet. When you examine the Eidolon grave, Mene warns you that something dangerous is there. You'll get a few chances to back out, so make sure you only fight it when you're ready. Your characters will also need the Ultima Weapon and at least the Ragnarok. After finishing the game, let the credits roll until the phrase "The End" appears. While it's on-screen, enter the following sequence of buttons on your controller to access the hidden card game "Blackjack": R2, L1, R2, R2, Up, X, Right, Circle, Down, Triangle, L2, R1, R2, L1, Square, Square, Start. The dealer deals out of two decks and stands on 17, and you begin the game with a bankroll of 1,000. On disc 4, get choco on the chocobo tracks on the lost continent. Take choco into the water, and use Dead Pepper where Shimmering Island used to be. Use Choco and go to the island right next to the sand pits that lead to the desert palace. Reach the Terrace where you fight Lich in Memoria within 12 game hours. If you make it, look on the right side of the screen for an action icon. On the platform right below the room where you fight Lich. Check the far left hand corner. Dig up treasure at Ocean Chocograph location (North of Dagguero and west of the long island). Use Dead Pepper on cracks in mountains near Oeilvert, near the ocean. Memoria, in the "evil eye" room. Go to the left upon entering, in between the two things sticking up, and search around until the action icon shows up. Memoria, in the Alexandria's destruction room. It's on the left side of the platform (the other side has a save point). Catch 99 frogs and defeat Quale. Source: Play Online, and FFIX Secrets & Side Quest FAQ by Edwin Chow.